Made from high quality butyl rubber. great tires and love the tubes. They go in so easy. Tires bead up nice as well!! The traction is great in the variety of terrain in Iowa were I do enduros. Very good tube at a great price. Noticeably thicker than the stock tubes in my son’s KLX110. Have used these tubes for many years. Never had a flat tire with a heavy duty tube. Only changed the tube when replacing the tire. Great value. Tough enough verses wt. My favorite tubes for mx and off road competition. The STI Heavy Duty Tube is nice insurance against flats. These tubes are twice as thick as the stock tubes and give me piece of mind when out in the woods. Plus I love the fact that the valve cap doubles as a valve core removal tool. It’s hard to review a tube. It goes in properly, inflates properly, and I didn’t have any problems with it. Everything was easy with this tube. Had a front and rear tube both develop odd pin hole leaks that could not be traced to anything but poor moldings. 40 years of riding and never had this happen before. Generally like products from Rocky Mountain but cannot recommend these tubes. Great product and would recommend it for you and there shipping is the best. It's still black, round and rubber, just like when I bought it. Hopefully it will last, haven't installed it yet. I'm getting sick of these automated systems asking for a review 10 minutes after you buy something. They’re thicker for sure, seem tough, haven’t had a flat yet. Works well, I carry it as a spare for my dual sport and trail riding. Good quality and price on these tubes. I’ll buy these again. So far so good. !!!!!!!!!!!!!!!!!!!!!!!!!!!!!!!!!!!!!!!!!!!!!! Not much to say. It is a tube. Good price. This is the only tube I have ever pinched and ruined while trying to install. Can not beat the value of this tube. Never have had any problems with these. My new favorite tube to install for sure. have used these tubes over and over in my sons Supermini. Product was as advertised, works well, great price, fast shipping. Would but again. I have yet to have a flat with this tube when properly installed. I ride and race everything from tight sigle track to desert. Good medium weight tube, much better than stock but not has heavy/bulky/difficult to install as a UHD (ultra heavy duty). Seem to be very good quality . Exactly as it’s states this is a very heavy duty tube! Will last to the abuse! works as a inner tube is supposed to. Have installed many of these in many tire sizes and have yet to have a failure due to the tube it's self. It's a tube, holds air like it should. It will not prevent pinch flats. Seems to be good quality, have used them a couple times without any issues. I can't say much about the durability since I've not had it long but so far no complaints. It's holding air. Always good to have extra tubes on hand. Great price ! I have never popped or pinched a tube before when installing or removing a tire, until these turds. There's a reason they're so cheap. You get what you pay for. Don't buy these tubes. This haevy duty tube is perfect for riding desert in AZ. I have a KTM 450 EXC. Rear tire size is 140/80/18 with front being 90/90/21. What is the correct tube to fit these tire sizes? BEST ANSWER: Sedona offers a 5.0-5.10x18 standard tube which is the equivalent of a 130-140 size tube. The next closest thing is the STI is the 110-100/100x18. Tubes expand and will fill the void of the larger tire and since it's a heavy duty tube, it will still be plenty thick. I have a 2008 Kawasaki KLR650 with a front tire size of 90/90-21 and a rear tire size of 130/80-17. What would be the front tire tube size and rear tire tube sizes? BEST ANSWER: The front tube would be a 2.75/3.00 - 21 size and the rear tube would be a 4.00/4.50 - 17 size. for the rear you could also use a 4.50/5.10 - 17 tube depending on availability. I always go with the closest tube size to my tire size. They are usually sized pretty close. BEST ANSWER: What size tires do you have on your machine? I want to run 3.00x17 front and 4.60x17 rear on my 2009 klx250sf what is the correct tube? the one that fits would probably be the correct tube to run. How durable it this tube? BEST ANSWER: They are very durable. I have been using theses tubes for several years now. I desert race and have never had a pinch flat and my son races motocross and have hade no issues. I have had great success with this tube. I had one last through 2 tires. I only put a new one in because I accidentally put a hole in it when installing the 3rd tire. Durability has been great. I repair bikes and have used these for over 3 years on a variety of bikes in both trail and mx applications. I recommend them. Best innertube i have ever purchased!! Two years old and still going strong! Outlasted a tire already!! Tube for the price is good quality. No problems. Have used for several years. Works for me, no problem after a year. Will an 80/100/21 tube fit my 90/100/21 tire? BEST ANSWER: I've done that hundreds of times. 10mm difference in width or height is perfectly acceptable and will not cause any issues when using a Heavy Duty Tube. hi Scott, I have never done that but would without hesitation. Really don't think it would be an issue. I'm using that same set up on the Shinko tire. Good so far. 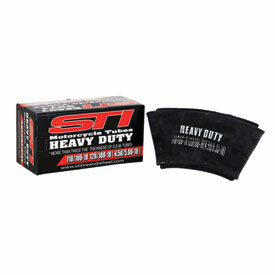 STI heavy duty tube. BEST ANSWER: I've used them for years on my dual sport without any problem. I don't know why it would say that, unless they're assuming that street bikes would be tubeless. I have used them for 3 years now without issue. How do the tubes handle on the highway? BEST ANSWER: We only race off road in the woods and a little enduro, which is maybe a few miles at low speeds (under 50mph) on the road. As far as our style of riding goes this is our first choice for racing every weekend! I haven’t used them highway. I’m sure they would be fine. They are very durable and last forever. tube was for a off road mx bike.. works very good at a great price. I have an XR 650L and don't have the old tube. Any guidance on the tube size? I have a 07 kx100 will this fit my rear wheel? KX100 OEM rear tire is a 90/100-16 as long as you choose the correct size while ordering it will fit. Ride on! Order the size of your rear wheel, which if stock is 16 inch. What tube size would fit an 09 drz-400s? What size is the rear inner tube to. 2001 Honda xr70r? Well Rigo, I used to be a motorcycle parts man at a Honda, Yamaha and Kawasaki dealer, and you always want to match the TUBE SIZE to the TIRE SIZE, which is printed on the sidewall of THE TIRE !! Probably a 2.50 x 12. What size tube do I need for an '07 RMZ-450?